You are here: Home / Skin / PiQo4 Laser – the Only Melasma Treatment that has Ever Worked for Me! As most of you know, I have hormonal acne which leaves gnarly scars that take forever to heal AND melasma (patches of hormone-triggered dark spots that are made worse with heat and sun). The acne is an ongoing battle and the melasma is also notoriously difficult to treat (and mine is no exception). I have the melasma on my cheeks and above my lip. 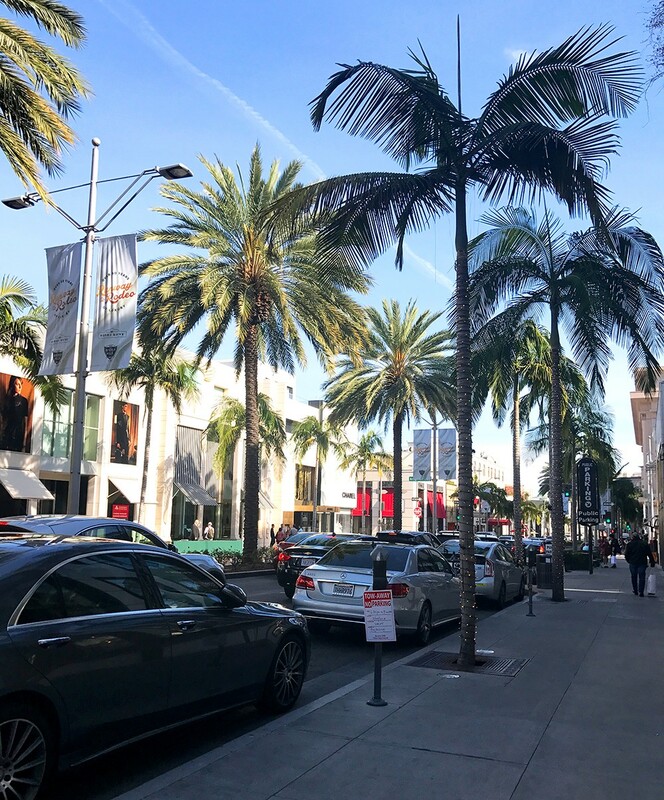 I consulted with Dr. Jennifer Herrmann of Moy Fincher Chipps Facial Plastics & Dermatology on Rodeo Drive in Beverly Hills in April (about 7 months before my upcoming wedding). First thing to note – if you have melasma, it’s very important to avoid IPL and other laser treatments that many med spas may try to sell you. The light and heat from these machines can actually make it worse. Dr. Herrmann was the first doctor who was able to help me. She used the PiQo4 laser, which is a laser used for tattoo removal and melasma. The reason it’s so successful for melasma is that the laser delivers energy so fast (in a picosecond) that it shatters the dark pigment without creating a lot of heat. Getting rid of melasma is a long and slow process – too much heat can make it worse, so it’s best to go slowly. 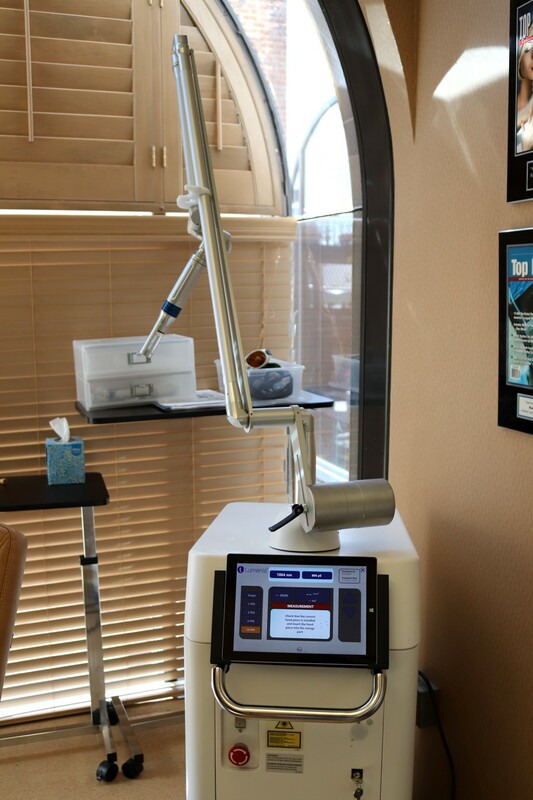 Click here to see a video of the PiQo4 laser in action. It doesn’t hurt because Dr. Herrmann numbs me up beforehand with lidocaine cream and she uses a low setting (my skin is super sensitive so we can’t go too high with it). After a treatment, it doesn’t hurt, but I’m red for about three days or so. It’s not bad and nothing makeup can’t cover. I’ve been getting treatments for about six months now and you can see it’s pretty much gone on one side (and much lighter on the other). It’s stubborn and hard to treat, so the sooner you get started, the better. 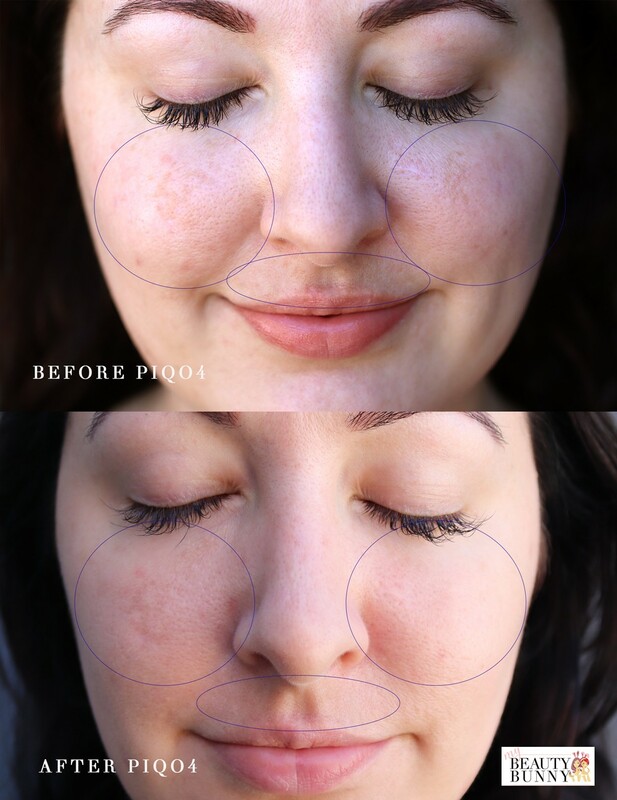 I’m still treating the melasma, and I have a few sessions to go before my wedding, but you can see how much progress we’ve made with 10+ PiQo4 laser treatments and two microneedling treatments! Dr. Herrmann also treated me with cortisone injections for the large cystic acne (better to get them to calm down before they cause scars!) and as I mentioned above, microneedling. The microneedling was something I’d highly recommend for anyone to deal with rough skin texture, fine lines, acne scars, and overall skin rejuvenation. You can do a series of microneedling treatments – one per month for 4-6 months should do the trick, but I saw results with a single treatment in April and then another in September. 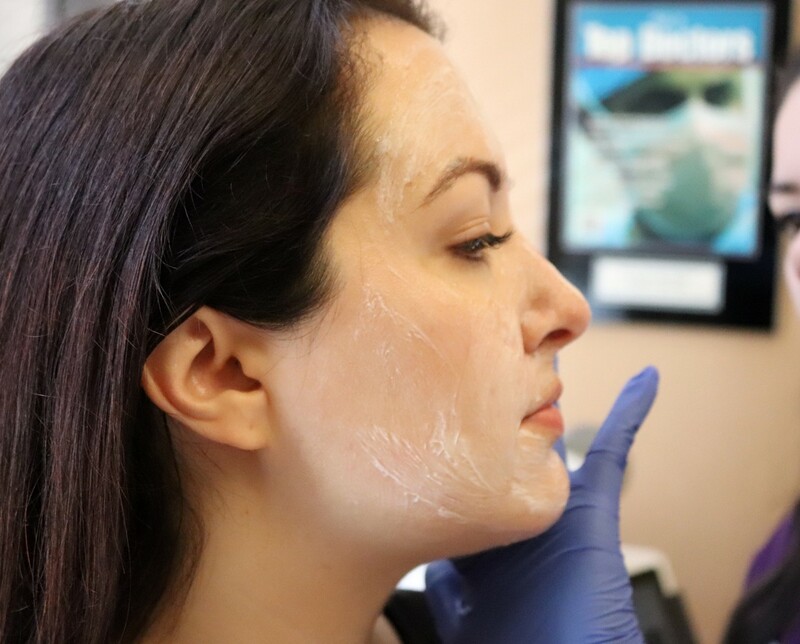 At Moy Fincher Chipps, they really massage the numbing cream into your skin for several minutes, which makes the lower level microneedling virtually painless. Since I know I have sensitive skin, I asked them to use the smallest needles all over, and then they went over the spots that needed it with medium level needles. My skin was very red right after the procedure, and after about 3-4 days, it looked radiant! My skin was smoother, brighter and scars were starting to fade. Click here to see a little video of the microneedling process. 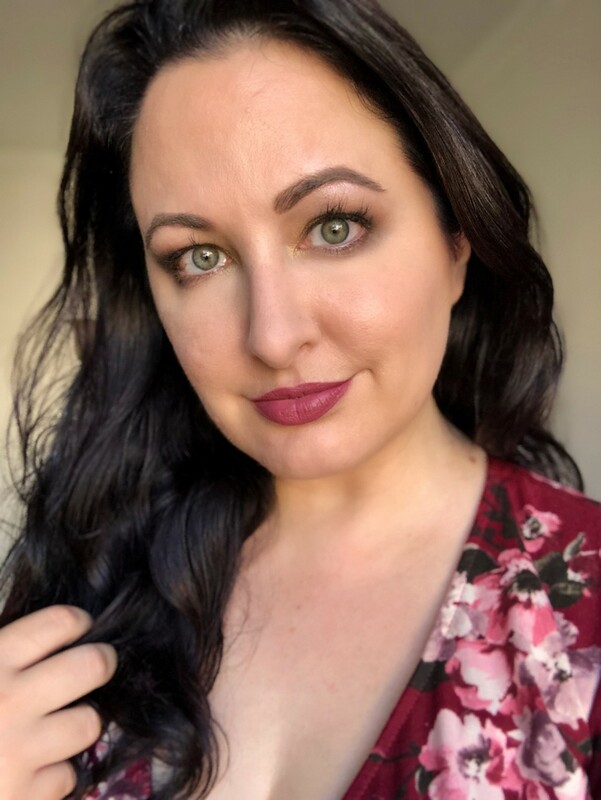 I ALWAYS wear sunscreen now – especially when I’m getting laser treatments (I bring it with me to apply after the laser) – but really all the time to keep my melasma from coming back. I even put it on when I’m working from home with the window shades open. Here are some cruelty free and acne-safe sunscreens I recommend. But one thing to note – DO NOT put sunscreen or any moisturizer on your face right after microneedling – you can cause all kinds of trouble – including a white “tattoo” of sorts or serious skin bumps and irritation. Just listen to the doc’s advice and always make sure you understand the after-care directions. If you have melasma (or acne), and if you’re in the Los Angeles area, I seriously could NOT recommend Moy Fincher Chipps more! They have every laser and treatment you could want, their staff is super knowledgable, and they are so nice (and not pretentious or sales-y like other doctors and med spas in the LA and Beverly Hills area)! I call them a “Disneyland for skincare” because they have so many treatment options! I went to the Beverly Hills location (on Rodeo Drive) but they have other locations in Encino and Torrance. Mention code MYBEAUTYBUNNY20 for 20% off your first treatment! And tell them I sent you. You won’t be disappointed! Loving this PiQo4 laser review? 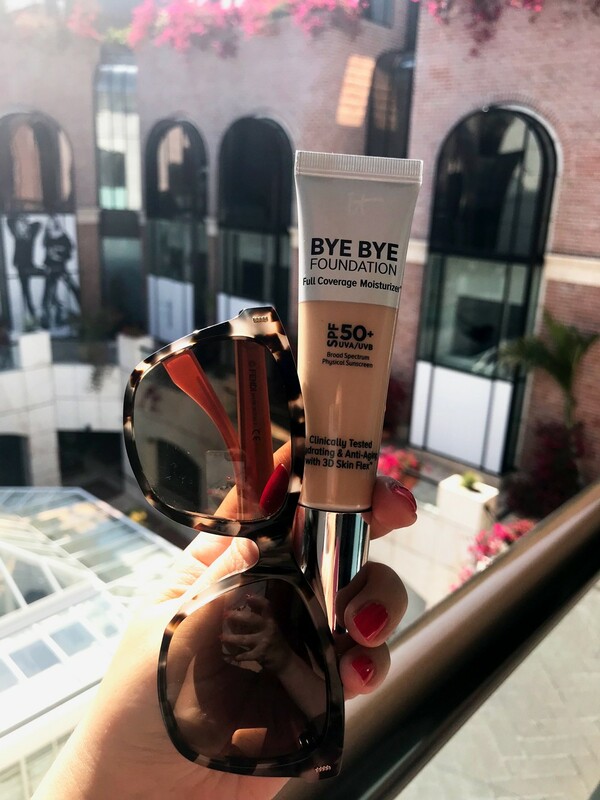 Take a look here for more of my skin favorites! « What are Your Favorite Green Beauty Brands? That’s so amazing that you found something that really works! Your eyes are just sparkling in this post. I have heard nothing but great things with the PIQO4 laser. I haven’t tried it and when I was working in plastic surgery, I didn’t really get to know the units. But I hear great things and you look fabulous. I have a microneedling appointment coming up. I’m hoping it can help with the rough “orange peel” texture on my nose and chin. Yes – I think it will! Mine has cleared up a bit. I definitely want to do more microneedling – maybe with PRP next time! This was such an interesting post, Jen. Your skin is looking wonderful. I have a couple of dark spots from sun damage that I would love to have treated. I’ve always thought that IPL was the correct approach. Guess I better make sure about that. Your results are amazing! I wish I had this treatment available near me. I would try it! Your skin looks amazingly good! The results are quite satisfying! Yeah – I guess it depends on the cause of the dark spots – if they are melasma, stay away from too much heat and light! The results are quite impressive! Seeing what your melasma look like in the before picture, I’m thinking that I probably have melasma too and not just “sun spots”. It looks very similar to what you had! Hi Jen, your skin looks amazing. I love the lipstick you’re wearing in the first photo – do you know what it Is? Oh thanks! I wish I could remember! It’s got to be either Stila or Too Faced!